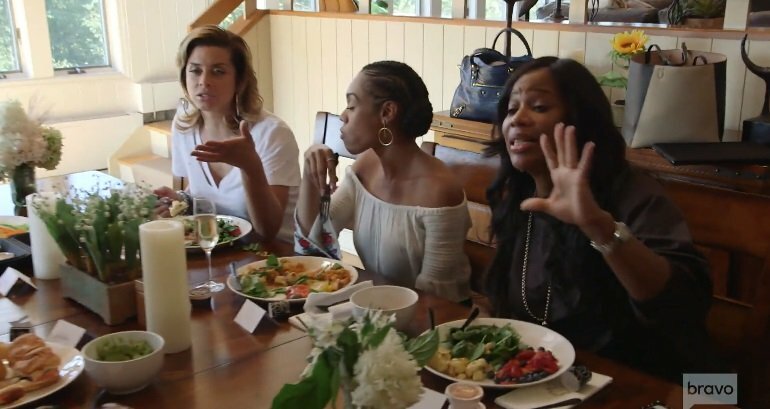 New girl Candiace Dillard isn’t wasting any time making enemies on Real Housewives of Potomac. As expected, Gizelle Bryant couldn’t stand her right from the jump. Gizelle has never warmed up to the new cast members, so that wasn’t shocking. During the last episode, Charrisse Jackson-Jordan asked if Candiace’s mom bought her engagement ring. Candiace didn’t react to the comment right away but she acted out for camera time confronted her about it later on- in front of the whole cast. Robyn Dixon stayed out of the drama on the last episode, but she had a lot to say about everything that went down in a Bravo blog post. Robyn wrote, “I believe Charrisse was joking, but I definitely think that asking Candiace if her mother bought her engagement ring was pretty damn shady.” Of course, it was shady. Charrisse is doing whatever she can to earn that Friend of the Housewives paycheck. Robyn explained, “I really stayed out of the ‘Candiace’s mom pays for everything’ talk because I really didn’t see an issue with her mother financially contributing to her lifestyle. But, since Candiace had shared so much information about her lifestyle, I can see why the ladies felt the freedom to probe Candiace even more, even in a jokingly shady way.” If they didn’t probe Candiace, this would be a very boring show. Robyn stated the obvious: “The clash between Candiace and Charrisse was very unnecessary and got completely out of hand.” Of course it did. That’s what always happens on reality TV shows. Robyn said, “It felt like Candiace was pumped up to all of a sudden clap back at every little comment and had something to prove. On top of that, the name-calling and age-shaming were extremely immature and disrespectful.” Of course, she was “pumped up.” She has no idea if she will be a one and done cast member or if she will get asked back for another season. She needed this big moment. Robyn concluded, “But in order for us ladies to move forward and have a great time at Nemacolin, the air needed to be cleared, and peace needed to be made. So once again, it felt as if Candiace really had something to prove when she started going at it with Gizelle. Despite what some people think, every disagreement does not have to be met with an argument, name-calling, raised voices, or a shady retort!” It doesn’t, but this show would be very boring if the disagreements lacked name-calling, raised voices, and shady retorts. TELL US – WHOSE SIDE ARE YOU ON: CANDIACE’S OR CHARRISSE’S?